Quality Kokanee are the highlight of this year's Whiskeytown Lake season! Last week provided some excellent Kokanee fishing on Whiskeytown Lake. Easy limits for our clients were had for most of the week, but the weekend saw a dramatic change in the bite. Federal water managers released over 6,000 acre feet of water from Whiskeytown, dropping the lake by nearly a foot. We still caught some quality fish on Saturday and Sunday, but our numbers saw a considerable drop. Whiskeytown Lake Kokanee enjoy stable water conditions and when the temps and or lake levels are changed over a short period of time they tend to shut down until stable conditions return. This year has seen a continuous inflow of cold water from Lewiston Lake and as water comes into Whiskeytown, water is then released into Clear Creek and Keswick Reservoir to maintain near full pool levels in Whiskeytown. It's a complex environment for the Kokanee and this season has been full of ever changing conditions. We're hoping that at some point this season stable water conditions will persist and we will have predictable fishing for the rest of the summer and early fall. In the meantime, I will continue to stay on top of bite patterns and will surely continue to experience some great days of fishing on Whiskeytown Lake through October. Currently I'm finding a good morning bite in 45' of water, give or take 5' feet. Most traditional Kokanee baits are attracting bites, and trolling speeds haven't changed for me at all. Mixing up your presentations until you find a bait and color the Kokanee are keying in on will help get the most bites during your day on the water. The Whiskeytown Lake Kokanee are continuing to grow at a steady pace and there are a few fish that are coming in at 17' inches now. The fight these fish are displaying after being hooked is impressive and it's getting to be more difficult to manage these hot fish near the boat. 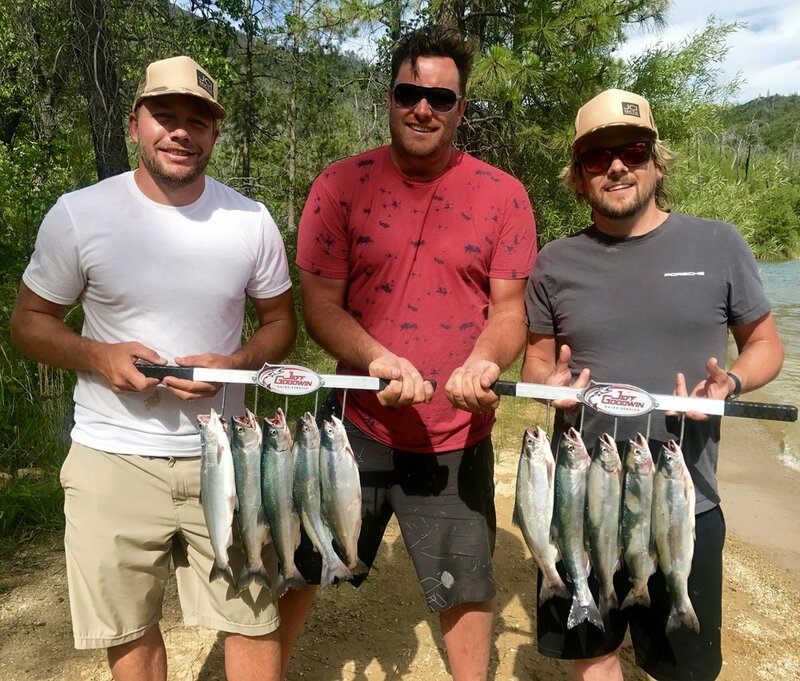 Ariel displays and tangled lines are becoming a part of everyday Kokanee fishing now and it's only going to get better as the season wears on. 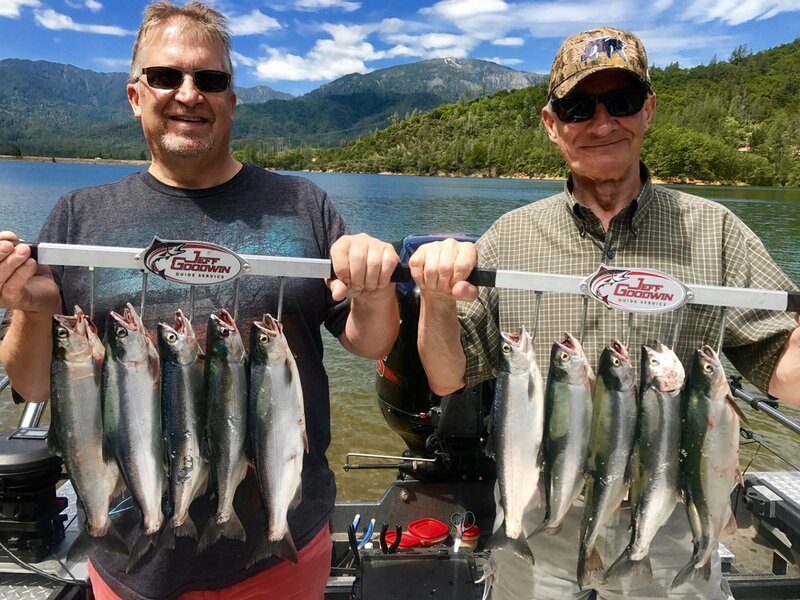 I'm expecting great fishing in July so if this Kokanee salmon fishery on Whiskeytown Lake is of any interest, now is the time to get your day on the water reserved. I can accommodate up to six anglers in my comfortable 24' foot boat and the canvas top provides shade for my clients on those really hot days on the water. Call (707) 616-1905 to book your trip today!